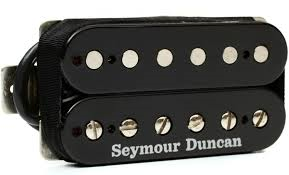 Warm, slightly-hotter-than-vintage humbucker. Great for blues, classic rock, southern rock, jam, and hard rock. Originally designed as a recreation of the pickups in the '59 Les Paul® Standard that defined the raw, rebellious sound of Texas blues-rock. The Pearly Gates is sweet, but slightly rude, with great sustain and a bright top end that make harmonics jump out of the guitar. Comes with four-conductor hookup cable. Often used in both neck and bridge positions. Can be used in the bridge with an APH-1n Alnico II Pro in the neck for smoother tones; or, a Pearly Gates in the neck with an SH-11 Custom Custom for heavier rock sounds from the bridge position.